The Jefferson Dairy (”Where Ice Cream Dreams Come True”) in Lake Hopatcong, NJ, is “out” of their pistachio, an icon on their permanent sign. 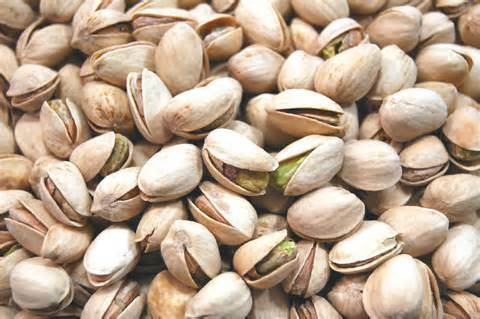 On two of myMEGusta’s two most recent forays to grocery stores, there were no pistachios! None! Not the house brand or the identical, overpriced “Wonderful” brand. Full disclosure: Costco, aka Land of Buying Power, has them. It’s the drought, and this is one of the many ways in which everyone is starting to feel the pain California is living through. 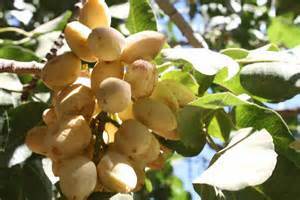 Even though the pistachio bush is native to arid climates and has a very low water requirement, the plants are suffering and yields are off, resulting in escalating prices. The “Wonderful” advertising campaign has, obviously, been put on hold. So, let’s move to happier thoughts of these lovely nuts, and the first that comes to mind is the extraordinary pistachio ice cream at Madu Café in Istanbul, a delicacy that tasted like icy cold ground nuts bound by gelato. And you don’t have to travel to Turkey to find it; there are over 200 Madu Cafes in the Middle East, Asia, Australia, and even in Bulgaria. And aren’t we happy that today’s pistachio ice cream has just a light hint of green, from the actual color of the nuts, rather than the neon green dye they used to use in the 50s? 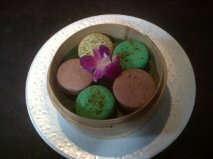 Pistachio macaroons are wildly popular in Europe, myMEGusta’s most recent tastes having been at Hakkasan in London (yes, French macaroons in a Chinese restaurant) and at Dallayou, the French patisserie where a “free” macaroon accompanies your morning café au lait. Another memorable dish, this time at La Grenouille in New York, was a pistachio soufflé, complete with a pistachio scented crème anglaise sauce. Have you wondered why the nuts are cracked open? This is a natural occurrence when they ripen, although the occasional shut nut does show up. Have you wondered how to open the ones that are nearly shut tight? Just take another half shell and pry it open. Toss the tightly closed ones to the squirrels. So, figure it out. Have some other nut to snack on. Or have the special black cherry ice cream at Jefferson’s, if you are there on the right day.